Chaucer, Shakespeare and Dickens are perhaps the three central figures of English literature. Representing respectively poetry, drama and prose, they have been hugely influential for centuries, read, analysed and quoted by countless millions around the world in every language from English and Afrikaans to Hindi and Mandarin. Dickens began his hate-stereotype as he meant to go on: sluicing Fagin with millennia’s-worth of gentile malice, from the red hair of Judas to the venality and ruthlessness ascribed to Jewish moneylenders in the Middle Ages. Fagin looks villainous because he is villainous: selfish, cunning, and manipulative. And his villainy is inseparable from his race and religion. Dickens refers to him as “the Jew” more than three hundred times in early editions of Oliver Twist. These claims are irrelevant. As I pointed out in “Reality is Racist,” if an accusation invokes a hate-filled stereotype, the accusation can be dismissed out of hand. All decent people know this. When the playwright Alan Bennett came across a British cartoon from World War II that portrayed “black marketeers” as “strongly Semitic in features,” he condemned it instantly as unacceptable, without pausing to consider whether it was based on a statistical reality. And it is decent people like Bennett and his fellow goodthinkers whom I want to address in this article. I want to alert them to the possibility that Dickens created another anti-Semitic hate-stereotype — one that has, unlike Fagin, gone unnoticed and uncondemned in the many years since it first appeared. A modern writer who used a character like Fagin would be of course be liable to prosecution and even imprisonment in most Western countries. Even in the nineteenth century Dickens was strongly criticized: one Jewish correspondent said that Fagin “encouraged a vile prejudice against the despised Hebrew.” Dickens was influenced by this criticism. He is known to have reduced references to Fagin’s Jewishness in later editions of Oliver Twist, and in his final novel, Our Mutual Friend (1865), he created a highly positive Jewish character called Riah (Hebrew for “friend”). But he may also have resented the criticism and responded to it by creating an implicit Jewish villain in a novel that closely followed Oliver Twist, which was first serialized in 1837. 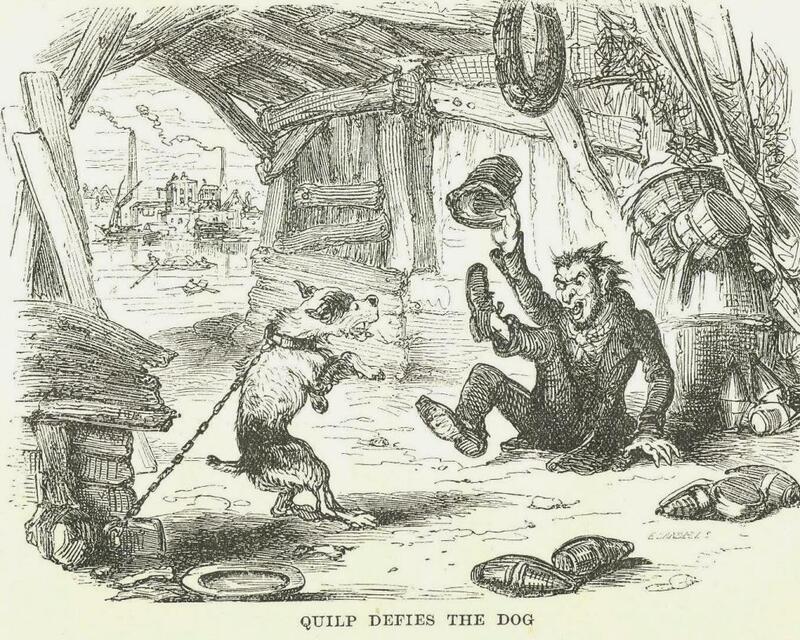 Dickens’ character Daniel Quilp appears in The Old Curiosity Shop, which was first serialized in 1840. Even people who haven’t read the book may know of it through Oscar Wilde’s alleged remark: “One would have to have a heart of stone to read the death of little Nell without dissolving into tears…of laughter.” Wilde was right: Little Nell is the book’s insipid and implausible heroine, quite literally too good for this world. The character then introduces himself: “Quilp is my name. You might remember. It’s not a long one — Daniel Quilp.” Daniel is a Biblical Hebrew name meaning “God is my Judge” but what is the significance of the invented surname Quilp? I’d suggest it’s a kind of verbal chord blending three concepts: Quick-Ill-Imp. Quilp is very fast in thought and deed. He’s called an “ill weed” by his wife’s mother, to whom he is an “impish son-in-law” (ch. IV). His diabolical aspect is underlined by Dickens’ repeated references to Quilp enjoying strong tobacco, flourishing in stiflingly smoky places, and drinking boiling liquids without suffering any harm. Quilp is a devious rent-collector and money-lender who describes his own nose as “aquiline” (ch. 49). Like Fagin, he is “villainous-looking,” “repulsive” and “dirty.” He has “matted hair” just like Fagin (ch. 67). Dickens describes him “rubbing his hands so hard that he seemed to be engaged in manufacturing, of the dirt with which they were encrusted, little charges for popguns” (ch. 4). 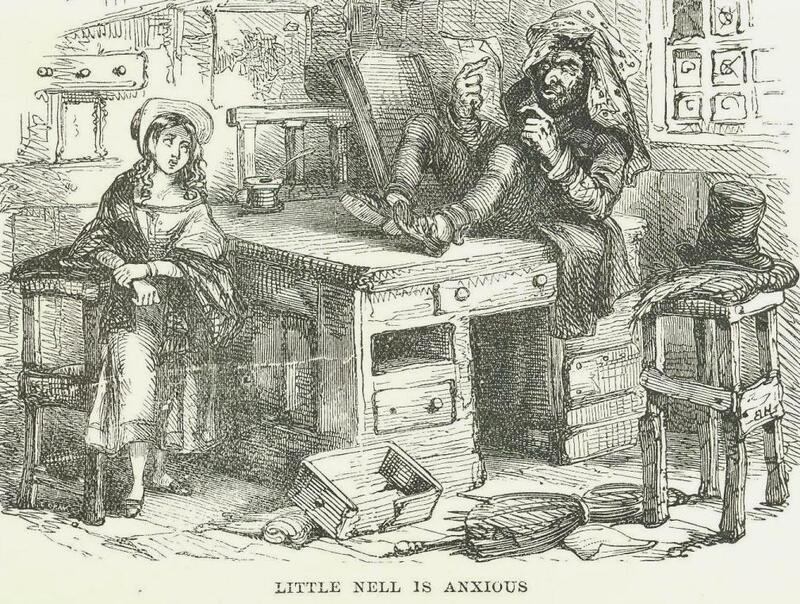 Like Fagin, he is endlessly greedy for money: when he thinks Little Nell’s grandfather has a “secret store of money,” “the idea of its escaping his clutches overwhelmed him with mortification and self-reproach” (ch. 13). Where Fagin is continually called “the Jew,” Quilp is continually called “the dwarf” — more than two hundred times, in fact. And while Quilp has “black eyes,” his bullied and intimidated wife is a “pretty little, mild-spoken, blue-eyed woman” (ch. 4). Little Nell is pretty and has blue eyes too (ch. 1). She is only thirteen, but Quilp is plotting to make her “Mrs Quilp the second, when Mrs Quilp the first is dead” (ch. 6). Dickens’ friend and first illustrator George Cattermole (1800–68) may have thought this suggested Jewish lust after blond, blue-eyed, non-Jewish women, because he unmistakably portrayed Quilp as a Jewish stereotype: hook-nosed, swarthy and scowling. Dickens did not object and I would suggest that the illustration exactly captured his intentions. As others have suggested, I am suggesting that Daniel Quilp was implicitly written as a Jewish villain. 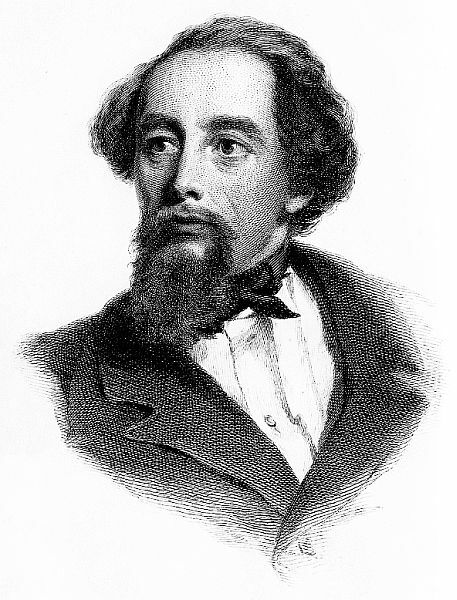 Dickens may have resented the criticism he received for his portrayal of Fagin in Oliver Twist. He had been accused of encouraging “vile prejudice,” when his intention, as always, had been to expose a reality in the hope of reforming it. Jewish criminals like Fagin really existed, just as brutal thieves like Bill Sykes and despairing prostitutes like Nancy did. Dickens had met and closely observed all three kinds of people. Why should he be condemned for speaking the truth about Fagin and not about Sykes and Nancy? Mr Quilp now walked up to front of a looking-glass, and was standing there putting on his neckerchief, when Mrs Jiniwin [his mother-in-law] happening to be behind him, could not resist the inclination she felt to shake her fist at her tyrant son-in-law. It was the gesture of an instant, but as she did so and accompanied the action with a menacing look, she met his eye in the glass, catching her in the very act. The same glance at the mirror conveyed to her the reflection of a horribly grotesque and distorted face with the tongue lolling out; and the next instant the dwarf, turning about with a perfectly bland and placid look, inquired in a tone of great affection. In spite of his mother’s injunction, Kit turned sharply round to look. Mr Quilp was serenely gazing at the stars, quite absorbed in celestial contemplation. But Quilp is also a way for Dickens to convey some shocking ideas about minorities in general. As a dwarf, Quilp belongs to a “visible minority” and is subject to majority prejudice: he is called “a little hunchy villain and a monster” by his mother-in-law and “an uglier dwarf than can be seen anywheres for a penny” by Kit, one of the book’s virtuous characters. In liberal ideology, these accusations should be grossly unjust or unfair. Quilp should be a saintly victim, displaying deep solidarity with other vulnerable communities and individuals. But he isn’t and he doesn’t. He provokes hostility by his own behaviour and malice. Far from sympathizing with the weak and helpless, he takes great delight in tormenting them. His chief pleasure in life is bringing pain and misery to others. And he is well capable of doing so. He is highly intelligent, cunning and perceptive. Despite his small size, he is also very strong and physically adept. He doesn’t hesitate to use his advantages. He keeps his wife up all night to watch him smoke and drink, grinning with delight when she makes “some involuntary movement of restlessness or fatigue” (ch. 4). He beats and bruises the boy who keeps watch on “Quilp’s Wharf” (ch. 6). He bullies Kit’s mother (ch. 48) and nearly succeeds in having Kit himself transported to an overseas penal colony on a trumped-up charge of theft (ch. 60). He tricks Little Nell and her grandfather out of their home and forces them out of London (ch. 12), thereby bringing about both their deaths. “Where do you come from?” he said [to the servant] after a long pause, stroking his chin. “A little devil,” said the child. These unusual answers might naturally have provoked some more inquiries. Quilp, however, without uttering another word, withdrew his eyes from the small servant, stroked his chin more thoughtfully than before, and then, bending over the note [he has written to the Brasses] as if to direct it with scrupulous and hair-breadth nicety, looked at her, covertly but very narrowly, from under his bushy eyebrows. The result of this secret survey was, that he shaded his face with his hands, and laughed slyly and noiselessly, until every vein in it was swollen almost to bursting. Pulling his hat over his brow to conceal his mirth and its effects, he tossed the letter to the child, and hastily withdrew. 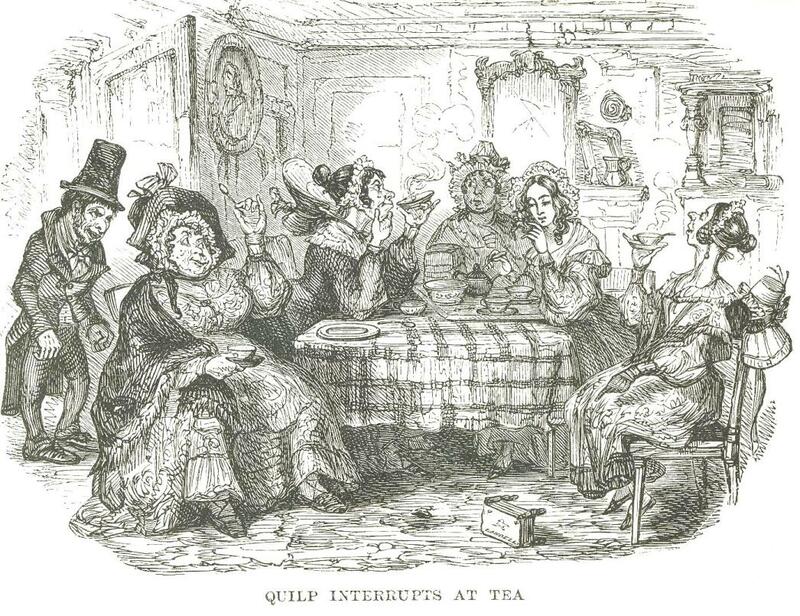 According to Claire Tomlin’s biography of Dickens, “a note in the manuscript suggested that she [the servant-girl] was the [illegitimate] daughter of … Sally Brass and Quilp.” Only slight hints of this survive in the published text, but it casts Quilp’s behaviour in an even worse light. He is laughing with delight at the suffering and hopeless situation of his own daughter, which he is rich enough to end immediately. Dickens’ understanding of human psychology is accurate: there are people who behave like that. In liberal ideology, however, Dickens is committing blasphemy. How dare he suggest that Quilp, one victim of majority hate, can take delight in the suffering of another victim? Daniel Quilp is addicted to spying: Dickens describes him as casting “a keen glance around which seemed to comprehend every object within his range of vision, however small or trivial” (ch. 3). He uses spyholes (ch. 49), eavesdrops at every opportunity (ch. 4, ch. 6 and passim), and offers “large rewards” for “any intelligence” of Little Nell and her grandfather (ch. 48) when they evade his plots. The more he knows, the more he has power over those whom he wishes to harm and the better he can protect himself from retribution. In short, he has the paranoia and vigilance of a minority that anticipates a hostile response to its own bad behaviour. Even when his own espionage fails him, he is warned by Sally Brass that her brother has exposed the plot to ruin Kit. The authorities are closing in on him as he camps out in his riverside counting-house, companioned by what he calls those “fine stealthy secret fellows,” that is, the rats. Quilp tries to escape arrest, but a heavy fog has fallen and he loses his way, falls in the Thames, and drowns. It’s a disappointingly banal end for someone who is, like Fagin and Shylock, one of the greatest villains in English literature. Unlike Fagin and Shylock, however, Quilp has never been called an anti-Semitic libel. Nevertheless, I believe that he is implicitly Jewish and that Dickens was creating an anti-Semitic stereotype: Quilp is highly intelligent but also highly malicious. Just as Dickens concealed the parentage of the servant-girl, fearing that he would shock his audience, so he concealed the race of Quilp, not wanting to be accused again of “vile prejudice against the despised Hebrew,” as he had been after the serialization of Oliver Twist. But his illustrator George Cattermole clearly read the textual hints — or followed Dickens’ private instructions — and drew Quilp as a Jew. No one remained now but the excitable Jew, who had already raised the skirts of Mr. Jaggers’s coat to his lips several times. That is not a positive portrait of Jewish behaviour or psychology. It also proves that Dickens was partly unrepentant after the criticism he received for Oliver Twist. When some years had elapsed, he again and openly encouraged “vile prejudice against the despised Hebrew.” To my mind, that strengthens the possibility that he secretly expressed that “vile prejudice” in The Old Curiosity Shop, published soon after Oliver Twist. But whether he was creating an overtly Jewish villain in Fagin or, as I would argue, a covertly Jewish villain in Daniel Quilp, Dickens was motivated not by hate or prejudice, but by realism and personal observation. Minorities and outsiders are not automatically saintly or automatically victims of the majority. Indeed, this simple fact is the main reason why Whites are making a catastrophic mistake in allowing themselves to become minorities. Despite his small size and isolation, Daniel Quilp is perfectly capable of bringing misery and ruin to those around him. As Dickens notes: “the ugly creature contrived by some means or other — whether by his ugliness or his ferocity or his natural cunning is no great matter — to impress with a wholesome fear of his anger, most of those with whom he was brought into daily contact and communication” (ch. 4). In The Old Curiosity Shop, Dickens commits blasphemy against liberal ideology. He was a literary genius, one of the most acute and sympathetic observers of human behaviour who ever lived, but he did not believe in the worship of minorities or the demonization of majorities. Instead, he thought that we should look at human beings and see them as they are. When they behave badly, they should be criticized for it, whatever their race or station in life. If we’re unable to expose reality, we’re also unable to reform it. Daniel Quilp, one of Dickens’ greatest villains, certainly knew that truth, which is why he concealed his own activities while spying constantly on those of others. The parallels with the behaviour of the hostile elite should be obvious. But the hostile elite is no more invincible than Daniel Quilp was. When reality is exposed, reform can follow. That is the task of websites like the Occidental Observer and movements like the Alt Right.